The shadow of the moon rushes toward me from the horizon and plunges me into a silvery darkness. All my senses prick up, registering the unfamiliar: my skin shivers as the temperature drops and the winds shift; my ears are alert to the unearthly silence, as everything is transfixed and still; my sixth sense, touched by the immensity of the moment, leaves every hair on my body standing on end. This may be an astronomical phenomenon, highly predictable, but it is out of the ordinary in every way. It is truly, to use the word consciously, extra-ordinary. My first total solar eclipse was in 1999, and I was hooked – since then I have viewed a further seven, with more planned. Viewing a total solar eclipse is often a challenge since their paths can stretch across oceans, polar regions or difficult to access places. But for those intrepid people who follow eclipses – often called “eclipse chasers” – it is absolutely worth the journey again and again. No two eclipse experiences are alike. The location, time of day, altitude in the sky, length of totality, and often, effort to get there, all form part of the story. Many people have experienced partial eclipses. They happen relatively frequently over vast swaths of the planet and are often imperceptible. Total eclipses are more rare – and are seen only by those within a narrow path of totality. As the moon’s shadow travels this path, it casts each spot along it, momentarily, into complete darkness, blocking all but the corona of the sun. Over a few minutes, you try desperately to take all the elements in: the diamond ring before totality, Baily’s Beads, the prominences, the shape of the corona, the planets, the darkness around you and the light on the horizon from whence the sunlight will come rushing back over you, ending your dizzying few minutes in the umbra. With so many details simultaneous and compressed, you inevitably take away something personal and unique. At the end of an eclipse, while still revelling in the beauty of it, many eclipse-chasers already turn to talk of the next one – who is going, where and how? The planning begins. Here I share images from the eclipses themselves (toggle off the captions for clearer views in full screen mode) but some of the behind the scenes stories of the eclipse-chasing and the photography can be found on my blog. "And as the desert offers no tangible riches, as there is nothing to see or hear in the desert, one is compelled to acknowledge, since the inner life, far from falling asleep, is fortified, that man is first animated by invisible solicitations. Man is ruled by Spirit. In the desert I am worth what my divinities are worth." - Antoine de Saint-Exupéry // I’ve long been a fan of deserts, having visited them on all continents and having traversed many in 4x4s or on camel. The names of the deserts are like beacons calling out to me: Atacama, Syrian-Arabian, Sahara, Thar, Gobi, Taklimakan, Namib, Kalahari, Kyzylkum, Karakum … But the one thing I was yet to do was walk across a desert, until now. And so, for my first expedition, I chose the Dasht-e-Lut in Iran (a desert I’d only visited the edge of). 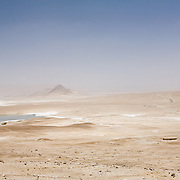 // The Dasht-e-Lut (or desert of emptiness) is one of the hottest and driest places on Earth. It has the distinction of having reached the highest land temperature on Earth of any recorded year ever (70.7C, 2005), and having the highest land temperature on earth for 5 near consecutive years around it. The Lut also is said to be the largest contiguous area of surface temperatures above 65°C of anywhere on Earth. 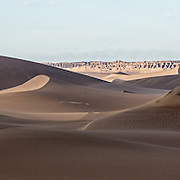 // It is also a fascinating varied landscape – from some of the world’s highest sand dunes, to oven like flat lands covered in dark rocks, to massive star dunes, to kaluts, the local name for yardangs (unique eroded rock formations created in the driest places on Earth by directional winds). And it’s not too big – only a few hundred kilometres across. // Naturally, this is an uninhabited area. There are some oasis villages on the fringes of the desert, but nothing in the middle of it. Indeed, most people don’t ever go in it and many locals are unaware of the dunes to be found there. From what we know, while there are nowadays some 4x4 journeys into the desert either to the dunes or the kaluts, no one has succeeded crossing it on foot. // The journey was arduous not due to distance but due to conditions -- and this meant little time to focus on photography. These images do not do justice to the beauty of this desert, and I will return one day to photograph it properly. // In the meantime, for more background stories on the expedition itself, please visit my blog or my facebook page. Turkmenistan is one of Central Asia’s lesser known ‘stans, yet one of its most fascinating. A large country bordered by the Caspian Sea, Iran, Afghanistan, Uzbekistan, and Kazakhstan, it has emerged from its time as an SSR into a nation rich with resources, politically neutral, running headlong into modernisation, yet also ruled by personality-cult leaders who impart few freedoms on its citizens. Most visitors pass through the country, if they stop at all, to see Merv and Konye-Urgench, two Silk Road cities, as well as the Darwaza gas crater, but spending more time and renting a car to get way off the beaten path reveals a friendly, history-rich, diverse country, with many untold stories the locals are happy to share with an intrepid traveller. 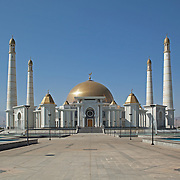 The capital, Ashgabat, blends old Soviet neighbourhoods with gleaming ultra-modern buildings lining wide boulevards, dotted with monuments to the nation’s history or its current leaders. Locals seem content with the country’s progress and are welcoming, inviting me to attend a wedding on my second day – a sign of the hospitality that would greet me throughout. Several hours outside of Ashgabat, en route to Silk Road ruins, is a village that blends animism with Islam and practices polygamy – and was allowed to continue in its ways through Soviet times. The ever-growing oil & gas industry marks the landscape through the west, but there is pride in these resources – particularly given that citizens enjoy great subsidies. The northern Yangikala canyon is unknown even to most locals – a parched, colourful and surreal landscape with occasional small villages and storied Sufi shrines nearby. On the other side of the Karakum, the remains of the Amu Darya River flow between Uzbekistan and Turkmenistan, creating fertile land near Dashoguz, the country’s third largest city. Produce-filled markets, more Silk Road ruins, and the inevitable cotton fields abound, despite the increasing salinisation of the land. The vast Karakum desert, one of the world’s driest, was a brutal and historically feared desert, with its many stories of bandits and slavery; today it contains fascinating villages, including one where a young girl writes poetry documenting the disappearing stories and pride of desert life. The well-known Darwaza (“Gates of Hell”), in the desert’s north, attracts tourists to see the fiery crater accidentally created more than 40 years ago. By day, it’s just a hole in the ground, but by night it glows, emanating light and heat from the burning gases deep inside. Crossing the Karakum, you reach an even more ancient site than the famed Silk Road cities: Gonur Depe was a large Bronze Age settlement, with a fire-worshipping culture, that the original archaeologist believes was related to early Zoroastrianism. As rivers shifted, the city fell into decline, not be discovered until 1972… and while excavations continue, the remarkable ruins are rarely visited by travellers even today. 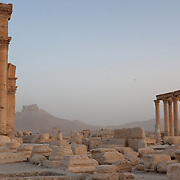 One of Syria’s most famous historical places, Palmyra, or Tadmor, sits at an oasis in the middle of the desert, today a small town next to a vast archaeological site. A grand ancient city that flourished due to its position as a stopover for trade caravans traversing the desert between Persia and the Mediterranean, it was mentioned in documents from Mari, the early Mesopotamian kingdom, and existed in various forms for several thousand years before the arrival of the Greeks and Romans. However, what remains of it today largely dates back to Greco-Roman times, filled with stories of Queen Zenobia who defied the Romans and built a short-lived Palmyrene empire. The town lost prominence in the 9th Century, although it continued to be inhabited in some form until Ottoman times, when it fell into decline. Today, it contains vast ruins, including the Temple of Bel, a large theatre, a colonnaded main street, several monumental arches, and the unique tetrapylons. When I arrived in May 2009, it was mid-afternoon, 35°C and dusty, so I chose to wait a few hours for the late afternoon light. That plan was completely laid to waste by the arrival of a tremendous sandstorm that reduced the sunlight to a red glow and visibility to near zero. From my hotel window, where I should have had a view across the oasis to the Temple of Bel and the columns of the colonnaded street, I could see almost nothing beyond a metre or two. At times, I could make out a palm tree shaking violently in the wind. The streetlights of the town came on and everything shut down – stores closed, doors were locked up and people went inside. I lay on my bed for hours, with the windows of my hotel glowing red-orange as the sun struggled to get through the cloud of sand. 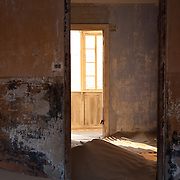 Despite the windows being closed, sand still came inside – I could feel and smell it as I breathed. Sand was everywhere. I wondered how the Bedouin people, or desert-dwellers, would be coping with this, sheltering in their tents. Several hours later, the storm began to lift – the air turned murky beige and outlines of buildings and trees came into view. I grabbed my chance to get a few pictures of Palmyra while it was clear enough to see. Normally full of tourists, the ruins were virtually abandoned, with everyone holed up in hotels or turning back to Damascus. I had the entire site to myself. It was hard to see and photograph, given the dust, but the power of the sandstorm gave it all an eerie feeling – an air of the uncommon which must have greeted travellers thousands of years ago as they came upon the oasis rising out of the harshness of the desert. It seemed, with the depth of view reduced by sand, more spectacular and awe-inspiring than it might have on a clear day, cloaked in a harsh, mysterious atmosphere and emptied of all people. I stayed until the sun had set. 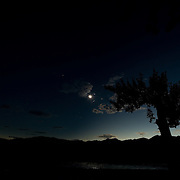 High above, the moon appeared in the night sky, but down below, the horizon was still obscured by the sand of a storm that would continue all night. Syria today evokes images of war and extremism, but a few years ago, it was an amazing place – generous people, beautiful landscape, vibrant cities, and vast history. I often want to show people images from my 2009 visit to remind them that Syria wasn’t always a harrowing place and to tell stories of its long history so people understand how much we share with and are connected to Syria. Its capital, Damascus, vies with its compatriot city, Aleppo, for the title of the world’s oldest continuously inhabited city. The city lies with the edge of the anti-Lebanon mountains on one side, and the vast Syrian Desert on the other - a strategic and beautiful place. First inhabited in 6000BC, it came to prominence under the Aramaeans, Mesopotamian nomads who imparted their language, Aramaic. Later, the Assyrians conquered it, then lost it to the Neo-Babylonians, led by King Nebuchadnezzar. It fell to the Achaemenid Persians, who ruled for 200 years before losing to the Greeks, led by Alexander, who laid out the foundations of the city before losing it to Petra’s Nabateans. All of this before the Romans came in 64BC at the start of 700 years of rule. It was during this time that many of the foundations of the city were brought together and built upon – the Hellenistic grid was expanded; archways, a walled city, a colonnaded Via Recta, and the Temple of Jupiter were built; and even the city’s water system was established. Under Hadrian, Damascus was declared a metropolis in 117AD. Christianity came to Damascus, as did St Paul with his vision of Jesus. Roman rule ended with the Muslim empires from Arabia declaring Damascus a capital of the Umayyad Empire, a new caliphate that expanded far and wide. Damascus languished under minor empires for the next few centuries, before the city rose again under Saladin, who fought off 3 attempts by Crusaders to take the city. It is said that at this point, Damascus was larger than Paris or Florence. Soon Mongols invaded and razed the city, before being defeated by Egypt’s Mamluks. Damascus flourished again. Then Tamerlane, from Samarkand, came and destroyed much of the city. Once again, the Mamluks came back and rebuilt. The Ottomans then ruled for four centuries and the city slowly lost prominence. Damascus was used as a base for the Germans and Turks in World War I. After the war, Damascus was given to the French as part of the French Mandate, despite great opposition. Finally, in 1946, Damascus became capital of an independent Syria. 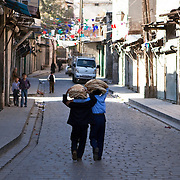 When I visited, Damascus was a bustling modern city, connected to its history and spirituality. 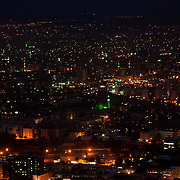 The night view from Mt Qasioun was sublime – city lights and green-lit minarets to the horizon. At sunset, the call to prayer began, with all the mosques’ individual broadcasts starting near simultaneously. Each was live, vibrant and real, individually distinctive yet, from a perch on top of the mountain, merged into a whole that rose up from the city below and hung in the air around me. “We travel not for trafficking alone / By hotter winds our fiery hearts are fanned / For lust of knowing what should not be known / We take the Golden Road to Samarkand.” - Flecker. The great cities of the Silk Road stretched east-west from China to Baghdad and beyond, and south to the Subcontinent, marking out trade routes that rose and fell with empires and carried goods, ideas, language and religion along its paths. For millennia, these routes were used in some form or other, but the Silk Road is most associated with the 1st-16th centuries. Different empires and regions dominated various periods, but for so many, the enduring images of the Silk Road are the Central Asian cities like Samarkand and Bukhara. What we see of them today really dates from the Turco-Mongol dynasties, with their Persian architecture, but these cities are far older and their histories far richer. And these are the cities that still remain. Many now lie as desolate archaeological sites, some surely yet to be discovered. I have long been fascinated with the Silk Road and have, over the last decade, traced it overland from China to Syria / Turkey, following as many routes as possible, visiting old caravanserai and markets, exploring the archaeological sites, crossing the deserts and mountain passes, meeting the people that now inhabit the cities and seeing the new version of trade that has replaced the old. It is a lesson in ancient history, economics, religion, culture, and geopolitics – as well as in the hospitality of a region where people have been accustomed to travellers for millennia. My first stop on the Silk Road was classic Uzbekistan, followed soon by Turkmenistan. While many archaeological sites are fascinating, they can be non photogenic, so the cities of Samarkand, Bukhara, and Khiva proved a great foundation for then re-imagining the glories of Merv, Konye-Urgench, and Dehistan. These are the images I share here, in Part 1. Samarkand is perhaps the most well known of the great cities, with a poetic name. Sogdian in its early days, it was conquered by a succession of empires from Achaemenids to Greeks to Sassanians to Turkic tribes and eventually the Mongols, before Timur (Tamerlane) made it the capital of the Timurid Empire. Buildings from that era remain today. Bukhara is another ancient city that grew in prominence in Persian times and today is a major historical site and modern city. 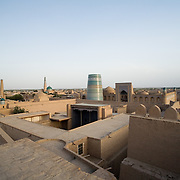 Khiva, across the Kyzylkum Desert, capital of its khanate, was the main northern town after Konye-Urgench, former capital of the Khorezm Empire, was destroyed by Timur, leaving only a few buildings. Dehistan was a smaller city in the Khorezm empire, en route to the Caspian, and today lies as rarely visited ruins. Merv, perhaps most surprising of all the cities for its obscurity today, was potentially the largest city in the world in 1150 and a major Islamic centre of learning, but it was destroyed by the Mongols in a massacre of up to a million people and never rebuilt. 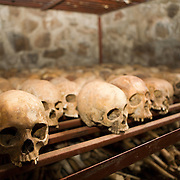 These images were taken in the village of Nyamata, where the church serves as a memorial of the Genocide. Everyone here has a story, and many seem to conflict slightly, told by those who as children experienced and survived the chaos and trauma of the genocide. With no other witnesses, in many cases, the stories cannot be verified, but given the commonality among them, they are likely somebody's experience, if not those of the individual recounting their story. On my visit, I was shown around the church by a man in his twenties, who was 9 when the genocide happened. He was in the church, where between 2,500-10,000 people died -- judging by the size of the building, it is most likely that 2500 died in the church itself, with many others killed in the village surrounding it. People had taken refuge in the church, crammed inside, with the door locked. The Hutu extremists arrived with guns and grenades -- shooting through the door until it opened, and throwing in grenades that left holes in the ceiling, which you can still see today. They then entered, slaughtered everyone in a small room near the entrance, carrying out body parts to demonstrate what was about to happen to the remaining people. My guide's mother was in that room. He lay on the ground near the alter, next to his sister, as the attackers came through, killing with guns and machetes, each person in the church, including my guide's sister who was raped and murdered beside him. He was stabbed in the leg -- he lifted his trouser leg to show me the scar. He lay still, and eventually, the attackers left, leaving the church in a pool -- literally -- of blood. He remained there for 9 days, he says, and wasn't discovered (despite the attackers returning several times with dogs) until he was rescued, only a few days before the RPF captured the area and drove the Hutu extremists out. During my tour, he showed me the blood stains on the walls, the grenade holes, the skulls (including one of his cousin, that he has labelled), and the clothes from the corpses, that are now piled high on each pew, as a reminder of the dead. We also went to the crypts, where row upon row of skulls and bones are laid out, along with coffins, each containing up to 30 people's remains. I visited this village on a Sunday, and nearby, the school has been made into a makeshift church, next to the foundations of a new church, the construction of which has stalled due to lack of funding. The villagers filled the makeshift church and were singing and praying, as I walked around the silent remains of the old church. After I left the memorial, I walked toward the new church and met some children outside -- they were all too young to have witnessed the genocide, but no doubt, they still grow up with the shadow of it cast over their lives. But they smiled and played, with a hope in their eyes that is hard to believe, given what I had just seen in the church -- a testament, of sorts, to the human spirit. Tajikistan, the smallest of the 5 former soviet ‘stans, sits snugly between Afghanistan to its south, Uzbekistan to its west and north, Kyrgyzstan to its northeast, and China to its east. It would border Pakistan, if it weren’t for a sliver of Afghanistan, the Wakhan Corridor, separating it, by sometimes as little as 10 miles. It’s a region where borders seem more defined by foreign politics than by ethnicity or geography; where people are a blend of so many empires that have passed through; and where the history is so rich and yet strangely unknown to most Westerners. The first thing one notices, defining almost all aspects of a trip, is the challenge of travel. Tajikistan is nearly all mountain (90-95%, according to my guide). Many passes are only open from June through October, many roads not traversable the remainder of the year. The roads that I travelled on were largely one car wide, making it rather tricky when meeting oncoming traffic, often high on a mountainside, with no barriers. Infrastructure is, thankfully, being improved. A tunnel has been built in the north, so that Dushanbe, the capital, is connected all year round to the northern mountain regions and onto Uzbekistan; roads are being widened all over the map; a border for goods has been opened to China in the far east of the country, where the Pamir Highway, built during Soviet times, already traverses the desolate landscape. But so much still remains undeveloped. Electricity is slowly being upgraded and there is talk of more hydroelectric dams on the rivers that eventually feed the Amu Darya River. But the plans for the dams also touch upon local politics and environmental issues – the Amu Darya River, which used to feed the Aral Sea, can no longer replenish its waters, and the Sea has shrunk dramatically. Yet this water is sorely needed by those along its route for watering crops – crops like cotton, which is tragically linked to the Aral Sea disaster. Tajikistan emerged into independence at the same time as many former Soviet states in 1991, but was immediately plunged into a Civil War, which claimed many lives. While today there is peace, there are still many remnants of the war, including discarded military equipment, scattered about. And it’s fresh enough in people’s minds for harrowing stories still to be told. Yet, despite all the statistics, the people are outrageously welcoming and embarrassingly generous. Without tourist infrastructure, one must simply rely on staying with locals in their homes and sharing meals with them. The regions bring incredible diversity. Much of the country is Sunni Muslim, but the Pamiri people of Gorno-Badakhshan are largely Ismaili. Ethnic Uzbeks make up a sizable portion of the population. There are descendents of the Sogdians who still speak a Sogdian language in a northern valley of the country. The east, high on the Pamir plateau, becomes more Kyrgyz the further you go, with yurts and yaks dotting the lunar landscape. “No permanence is ours … we are the everlasting guest” – Hermann Hesse, Lament (a poem in The Glass Bead Game) // Impermanence is a theme I’ve been attracted to my whole life. It has invariably influenced my view on the world and infused a lot of my photography with an undercurrent of absence and loss. I find this most acute in abandoned structures, which are losing their strength to the early stages of decay. None is more emotive or powerful, for me, than the image of the home, collapsing, lonely, devoid of the life that once filled it. It is resonant in a very personal way. The two locations I have selected here draw on the sense not only of our own impermanence, but also of the impermanence of everything we create, which will eventually be consumed by the environment and returned to the earth. Location 1 includes a single image from a former whaling station on a small volcanic island in the Antarctic Peninsula. I felt a connection to this solitary building, which appeared almost to be collapsing under the weight of the frozen mountain behind. Location 2 includes a more intimate series, taken inside the collapsing homes of a former diamond-mining town in the Namibian desert. The homes are now being reclaimed by the inexorable power of the desert. Aleppo, much like Damascus, vies for the title of the world’s oldest continuously inhabited city. It has an equally long but distinct history. Aleppo was a trading centre, which rose and fell under successive empires. It was inhabited as far back as 6000BC, but as in Damascus, the history lies underneath the current city, making excavations difficult. However, records from other cities make reference to Aleppo, which was thriving as a commercial centre in the 17th and 16th C BC. Over the years, it fell to the Hittites, Seleucids, Persians, Byzantines, Mongols and Ottomans. It also saw many devastating earthquakes, including the 4th deadliest earthquake ever, which struck 11 October 1138, measuring 8.5 on the Richter scale and killing upwards of 230,000 people. When I visited in 2009, the city was a quite magical place, imbued with history. Its personality seemed to lie in its meandering alleyways, archways, and cobblestone streets. History felt more preserved there than in Damascus, despite it being a large city. Traditional olive oil soap – the first bar soap ever invented – was still made there and sold in the market place in different grades. The souk was lively and bustling, full of artisans and fabrics, spices and fragrances, teashops and courtyards, shisha pipes and daily provisions. Within the Old City, the citadel sat high on a hill, a fortress originally built by the Seleucids but reinforced by later conquerors, particularly the Mamluk. A view from the top afforded great views over the city’s old and modern areas, which comfortably merged together. And it was near the Citadel early one morning that I was invited inside a bread factory. Throughout Syria, flatbread is the staple food for all meals. In the countryside, it is baked traditionally in an outdoor clay oven. In the city, it is often made in small neighbourhood factories. Although the streets are quiet in the early hours (the markets are not yet open; the people still at home) the bread factories are full of life. Having photographed the eerily quiet streets, I was suddenly in the action in a bread factory: meeting the people and seeing the machines that shaped, flattened, and baked the bread before it was cooled on a conveyor belt that delivered it to a room where it would be weighed and sold to the hungry masses. When the bread was almost ready, a crowd had formed at the sales window, as I sat inside sipping tea. They pressed up against the window, all trying to reach in with their money to be the first to get some bread. As the flatbreads began to come into the room on the conveyor belt, a man set down his cigarette and tea and began to pile them on the traditional scale, handing stacks of bread out the window and grabbing money from outstretched arms. Outside, more people arrived, parked bikes, and pressed up against the window, as others – such as the two boys in my final photograph – walked home with piles of fresh bread in their arms, in baskets, or balanced on their heads.